daryan, M., Taleizadeh, A. (2016). Coordinating Pricing and Ordering Decisions in a Multi-Echelon Pharmacological Supply Chain under Different Market Power using Game Theory. Journal of Industrial and Systems Engineering, 9(1), 35-56. Mahsa Noori- daryan; Ata Allah Taleizadeh. "Coordinating Pricing and Ordering Decisions in a Multi-Echelon Pharmacological Supply Chain under Different Market Power using Game Theory". 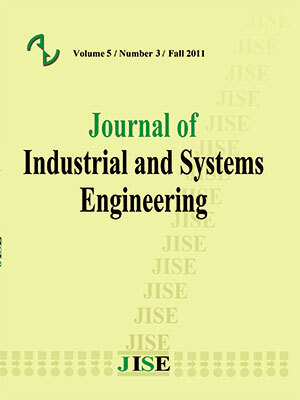 Journal of Industrial and Systems Engineering, 9, 1, 2016, 35-56.
daryan, M., Taleizadeh, A. (2016). 'Coordinating Pricing and Ordering Decisions in a Multi-Echelon Pharmacological Supply Chain under Different Market Power using Game Theory', Journal of Industrial and Systems Engineering, 9(1), pp. 35-56.
daryan, M., Taleizadeh, A. Coordinating Pricing and Ordering Decisions in a Multi-Echelon Pharmacological Supply Chain under Different Market Power using Game Theory. Journal of Industrial and Systems Engineering, 2016; 9(1): 35-56. School of Industrial Engineering, College of Engineering, University of Tehran, Tehran, Iran . The importance of supply chains in pharmacological industry is remarkable so that nowadays many pharmacological supply chains have an effective and critical role for supplying and distributing drugs in health area. So, this study studies a three-echelon pharmacological supply chain contained multi-distributor of raw materials, a pharmaceutical factory, and multi-drug distributors companies such that distributors of raw material, order raw materials of some drugs to own suppliers and sell them to the pharmaceutical factory. Then it transmutes raw materials to the several finished products and sells them to the some drug distributors companies. There are several types of raw materials and finished products. Here, it is supposed that the market powers of partners are different. So, the Stackelberg game among the members of the chain is deemed to analyze the coordination behavior of the members of the proposed chain. The aim of the research is to maximize the total profit of supply chain by employing the optimal pricing and ordering decision policies where the order quantities of the distributors and the selling prices of pharmaceutical factory (manufacturer) and the distributors are the decision variables. Besides, the closed form solutions of the decision variables are presented. At the end, numerical example and some sensitivity analysis are presented. Lee, H., Rosenblatt, M.J., (1986). A generalized quantity discount pricing model to increase supplier’s profits. Management Science, 32, 1177–1185. Boyaci, T., Gallego, G., (2002). Coordinating pricing and inventory replenishment policies for one wholesaler and one or more geographically dispersed retailers. International Journal of Production Economics, 77, 95–111. Abad, P.L., (2003). Optimal pricing and lot-sizing under conditions of perishability, finite production and partial backordering and lost sale. European Journal of Operational Research, 144 (3), 677–685. Dai, Y., Chao, X., Fang, S.C., Nuttle, H.L.W., (2005). Pricing in revenue management for multiple firms competing for customers. International Journal of Production Economics, 98, 1–16. Rosenthal, E.C., (2008). A game-theoretic approach to transfer pricing in a vertically integrated supply chain. International Journal of Production Economics, 115, 542–552. Szmerekovsky, J.G., Zhang, J., (2009). Pricing and two-tier advertising with one manufacturer and one retailer. European Journal of Operational Research, 192, 904–917. Xiao, T., Jin, J., Chen, G., Shi, J., Xie, M., (2010). Ordering, wholesale pricing and lead-time decisions in a three-stage supply chain under demand uncertainty. Computers & Industrial Engineering, 59, 840–852. Cai, G., Zhang, Z.G., Zhang, M., (2009). Game theoretical perspectives on dual-channel supply chain competition with price discounts and pricing schemes. International Journal of Production Economics, 117, 80–96. Soon, W., (2011). A review of multi-product pricing models. Applied Mathematics and Computation, 217, 8149–8165. SeyedEsfahani, M.M., Biazaran, M., Gharakhani, M., (2011). A game theoretic approach to coordinate pricing and vertical co-op advertising in manufacturer–retailer supply chains. European Journal of Operational Research, 211, 263–273. Hua, G., Wang, S., Cheng, T.C.E., (2012). Optimal order lot sizing and pricing with free shipping. European Journal of Operational Research, 218, 435–441. Mutlu, F., Cetinkaya, S., (2013). Pricing decisions in a carrier–retailer channel under price-sensitive demand and contract-carriage with common-carriage option. Transportation Research Part E, 51, 28–40. Giri, B.C., Sharma, S., (2014). Manufacturer's pricing strategy in a two-level supply chain with competing retailers and advertising cost dependent demand. Economic Modelling, 38, 102–111. Taleizadeh, A.A., Noori-daryan, M., (2015a). Pricing, manufacturing and inventory policies for raw material in a three-level supply chain. International Journal of System Science, 47(4), 919-931. Ekici, A., Altan, B., and Özener, Ö. Ö. (2015). Pricing decisions in a strategic single retailer/dual suppliers setting under order size constraints. International Journal of Production Research, doi:10.1080/00207543.2015.1054451 (In Press). Whitin, T.T., (1955). Inventory control and price theory. Management Science, 2, 61–68. Hill, R.M., (1999). The optimal production and shipment policy for the-single vendor single-buyer integrated production-inventory problem. International Journal of Production Research, 37, 2463–2475. Jorgensen, S., Kort, P.M., (2002). Optimal pricing and inventory policies: Centralized and decentralized decision making. European Journal of Operational Research, 138, 578–600. Khouja, M., (2003). Optimizing inventory decisions in a multi-stage multi-customer supply chain. Transportation Research part E, 39, 193–208. Ben-Daya, M., Darwish, M., Ertogral, K., (2008). The joint economic lot sizing problem: Review and extensions. European Journal of Operational Research, 185, 726–742. Yu, Y., Huang, G.Q., (2010). Nash game model for optimizing market strategies, configuration of platform products in a Vendor Managed Inventory (VMI) supply chain for a product family. European Journal of Operational Research, 206, 361–373. Ru, J., Wang, Y., (2010). Consignment contracting: Who should control inventory in the supply chain. European Journal of Operational Research, 201, 760–769. Guan, R., Zhao, X., (2011). Pricing and inventory management in a system with multiple competing retailers under(r, Q) policies. Computers & Operations Research, 38, 1294–1304. Arkan, A., Hejazi, S.R., (2012). Coordinating orders in a two echelon supply chain with controllable lead time and ordering cost using the credit period. Computers & Industrial Engineering, 62, 56–69. Kovacs, A., Egri, P., Kis, T., Vancza, J., (2013). Inventory control in supply chains: Alternative approaches to a two-stage lot-sizing problem. International Journal of Production Economics, 143(2): 385-394. Cardenas-Barron, L.E., Sana, S.S., (2014). A production-inventory model for a two-echelon supply chain when demand is dependent on sales teams' initiatives. International Journal of Production Economics, doi: 10.1016/j.ijpe.2014.03.007 (In Press). Taleizadeh, A.A, Noori-daryan, M., Cárdenas-Barrón, L.E., (2015a). Joint optimization of price, replenishment frequency, replenishment cycle and production rate in vendor managed inventory system with deteriorating items. International Journal of Production Economics. 159, 285–295. Taleizadeh, A.A, Noori-daryan, M., Tavakkoli-Moghaddam, R., (2015b). Pricing and ordering decisions in a supply chain with imperfect quality items and inspection under buyback of defective items. International journal of Production Research. 53(15), 4553-4582. Cachon, G., Netessine, S., (2004). Game theory in supply chain analysis. In: Simchi-Levi, E.b.D., Wu, S.D., Shen, M. (Eds. ), Supply Chain Analysis in the e-Business Era. Kluwer Academic, Norwell, MA (Chapter 2). Yu, Y., Liang, L., Huang, G.Q., (2006). Leader–follower game in vendor-managed inventory system with limited production capacity considering wholesale and retail prices. International Journal of Logistics: Research and Applications, 9 (4), 335–350. Nagarajan, M., Sosic, G., (2008). Game-theoretic analysis of cooperation among supply chain agents: Review and extensions. European Journal of Operational Research, 187, 719–745. Cai, G., Chiang, W.C., Chen, X., (2011). Game theoretic pricing and ordering decisions with partial lost sales in two-stage supply chains. International Journal of Production Economics, 130, 175–185. Zhao, X., Atkins, D., (2009). Transshipment between competing retailers. IIE Transactions, 41(8), 665-676. Huang, Y., Huang, G.Q., Newman, S.T., (2011). Coordinating pricing and inventory decisions in a multi-level supply chain: A game-theoretic approach. Transportation Research Part E, 47, 115–129. Chen, X., Li, L., Zhou, M., (2012). Manufacturer’s pricing strategy for supply chain with warranty period-dependent demand. Omega, 40, 807–816. Pal, B., Sana, S.S., Chaudhuri, K., (2012). A three layer multi-item production–inventory model for multiple suppliers and retailers. Economic Modelling, 29, 2704–2710. Zhao, J., Wang, L., (2015). Pricing and retail service decisions in fuzzy uncertainty environments. Applied Mathematics and Computation, 250, 580–592. Qi, Y., Ni, W., Shi, K., (2015). Game theoretic analysis of one manufacturer two retailer supply chain with customer market search. International Journal of Production Economics, doi:10.1016/j.ijpe.2015.02.005 (In Press).